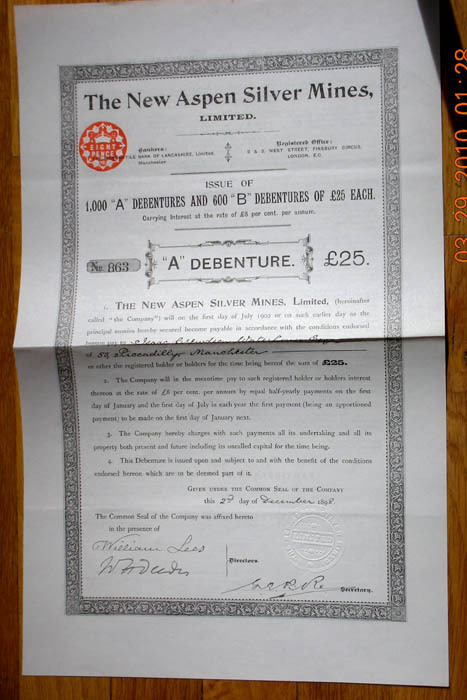 Certificate number 1, issued March 6, 1894, uncancelled, signed by John F. Campion. Mining property located in the Breckenridge Mining District, Summit County, Colorado. John F. Campion, born on Prince Edward Island, Canada, in 1849, became a mining entrepreneur in 1868, when he became involved in a White Pine silver mine. After experience in both California and Nevada, Campion moved to Leadville in 1879 to join that boomed. There, he invested in the Bison, Elk, Reindeer and Ibex (Little Johnny) mines. 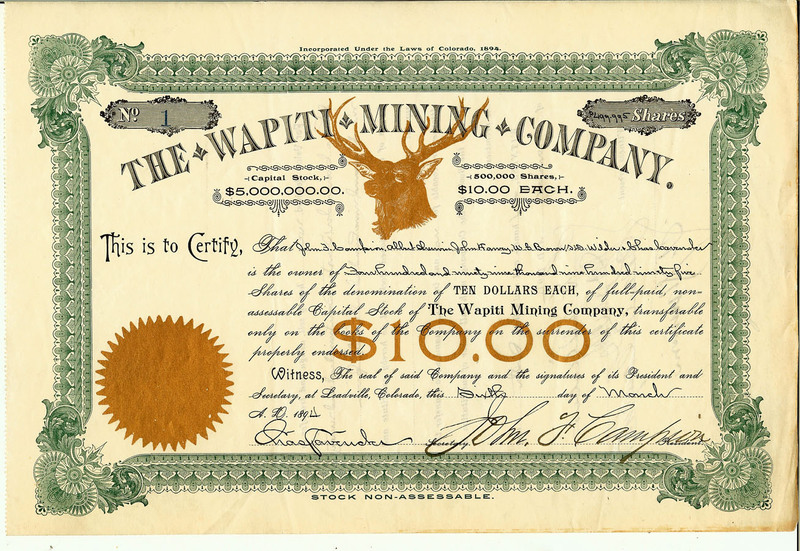 From the profits in these properties, Campion invested in the Wapiti Mine, Farncomb Hill, in Summit County, near Breckenridge. Gold soon poured forth from this property; and, many of the high-grade specimens he collected from this mine became part of a large and significant collection donated to the Denver Museum of Natural History. 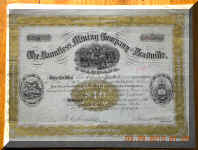 Stock certificate number 6, issued for 1,000 shares. 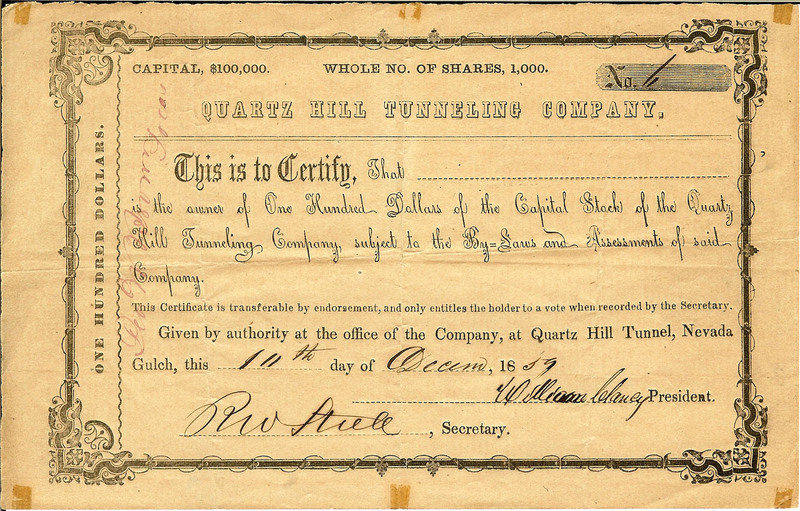 Certificate issued December 10, 1859 -- the year of the Pike's Peak Gold Rush! Signed by the Jefferson Territory Governor, Robert W. Steele, as secretary and William Clancy, one of the founders of The Denver City Town Company. 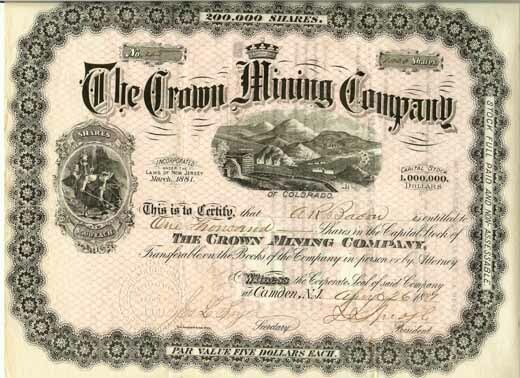 Mining property was located in Nevada Gulch, between Quartz and Gunnell hills, near Nevadaville, Gilpin County, Jefferson Territory. The mining, at this time, and in this area was generally accomplished via sluicing, rocking, and panning, and the quartz rock crushed with the use of arrastas. 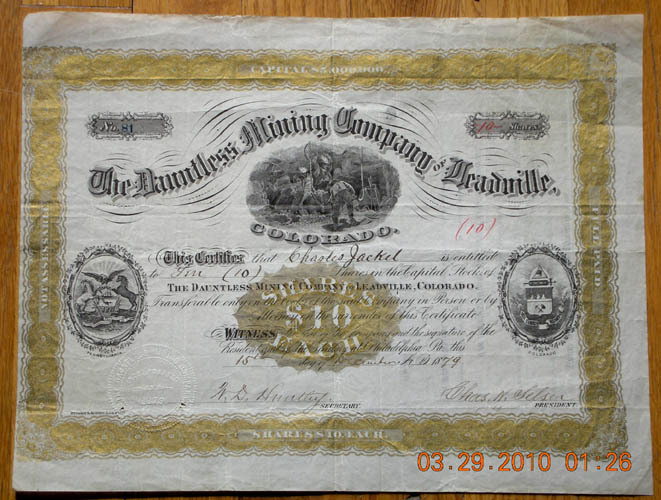 This is the earliest Colorado mining stock certificate we have seen in a private collection. Issue date indicates it was signed while Colorado was known as the Jefferson Territory, a very brief period before it was officially designated by the U.S. Congress as the Kansas Territory. Issued December 15, 1879; uncancelled. Oversized certificate. Breuker & Kessler, Lithographers, Philadelphia. Mining property in the Leadville Silver Mining District, Lake County, Colorado. Condition: very good plus. 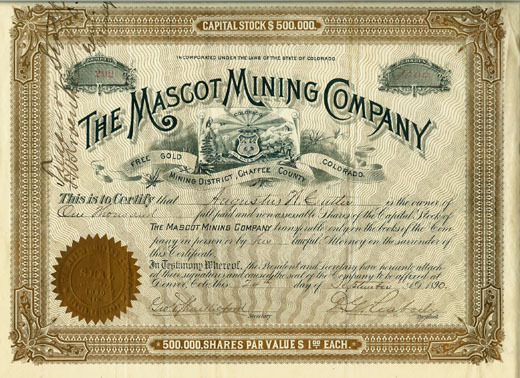 Issued September 24, 1890; uncancelled. Printed on certificate: "Free Gold Mining District, Chaffee County, Colorado." Oversized certificate. Incorporated under the Laws of the State of Colorado. Folds, otherwise very good plus condition.